The Lakers have added one of the league’s top long-distance threats, as Reggie Bullock will become the next to don the purple and gold. Bullock — who was acquired from Detroit on Wednesday in exchange for Svi Mykhailiuk and a future second-round pick — is in the midst of the best season of his six-year career. Elite beyond the arc, the 27-year-old currently ranks 12th in the NBA in made 3-pointers, tying Kyrie Irving and Bradley Beal with 2.6 made treys per game. The 6-foot-7, 205-pound wing is hitting those 3s at a 38.8 percent clip — best among both the Pistons and Lakers. Reggie Bullock brings top-level shooting to a team that needs it. • Currently ranks 12th in the NBA in made 3s (2.6) on a 38.8% clip. • Last year, shot the league's 2nd-best 3-point percentage (44.5%). The best part about Bullock’s game is his shooting versatility, as he can fill the bucket off a variety of different looks. He is an excellent catch-and-shoot scorer, averaging 6.9 points off such attempts — fourth-most in the league behind only Stephen Curry, Klay Thompson and Buddy Hield. LeBron James and Rajon Rondo are two of the league’s best at finding spot-up shooters on pick-and-rolls. Those possessions (and James’ post-ups) lead to many catch-and-shoot opportunities, though the Lakers have struggled to convert them. L.A. shoots the league’s worst percentage on catch-and-shoot attempts (33.1), so Bullock should serve as a much-needed buoy in that department. Reggie Bullock ranks 4th in the NBA in scoring on catch-and-shoot shots (6.9), with only Steph, Klay and Buddy Hield averaging more. Look for him to be the go-to guy when LeBron draws double-teams. Bullock also promises to become a huge part of the Lakers’ playbook given his ability to consistently strike out of designed actions. This year he ranks in the 93rd percentile as a scorer off screens, averaging 1.24 points per possession. He was also elite last season, placing among the 92nd percentile (1.28 ppp). Bullock is also an active screen-setter himself and often diverts the defense’s attention by placing his own pick before darting around someone else’s. Techniques like these have led to his robust 45.8 percentage on corner 3’s. Much of Detroit’s offense revolved around having Bullock orbit around its playmaking bigs: Blake Griffin and Andre Drummond. These actions served essentially as screens for Bullock, who ranks third in the NBA in scoring off handoffs (2.6), behind only J.J. Redick and Damian Lillard. Most of those handoff actions were in tandem with Griffin. The Lakers could potentially replicate such possessions with LeBron, JaVale McGee or Tyson Chandler serving that role. Only two players (Redick, Lillard) are averaging more points off handoffs than Reggie Bullock, who thrived out of a two-man game with Blake Griffin. There’s no doubt that Bullock’s greatest strength is his 3-point shooting, but he can strike from inside the arc as well. He’s not one to attack the basket often, as 84 percent of his shots have been jumpers. But that skill has made him a mid-range master. This season he has shot 50.9 percent from mid-range — one of the few players in the NBA hitting more than half of his attempts from that area. Still coming into the prime of his career, Bullock remains a player in progress. He’s solid in the restricted area (57.4 percent), but the same cannot be said in the non-restricted paint (18.2). He hasn’t been asked much to create his own offense, as 88 percent of his baskets have been assisted. Yet he’s a player who — after averaging fewer than five points in each of his first five seasons — has found his place in this league. Bullock’s average has jumped to 12.1 points per game this season. Last year he was second in the entire NBA in 3-point percentage (44.5). And, most importantly, he fills a vital void for the Lakers. A career 40 percent 3-point shooter who has sunk 88 percent of his foul shots this season, Bullock is a key puzzle piece for a Lakers squad currently 29th in 3-point shooting and last in free throw percentage. 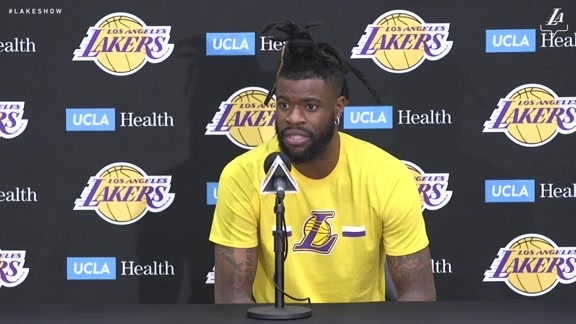 OFFICIAL: Lakers Acquire Reggie Bullock Welcome to L.A. @y0bull!